Kisavos is a mountain with two aspects: The barren and rocky north-western side from where becomes the classic ascent in top (alt.1978 m.) with departure from the village Spilia (alt. 800 m.). On the contrary, his southern and Eastern side is plenty of forests. Mixed vegetation, bushy near in the level of sea, with platans and hydric trees in the streams, gives her place in forests of beech and fir more tally. Discover the mountainous village Melivia in South-eastern hillside's of Kisavos, that has symbol the Filoktiti, fabulous king and hero of Troy’s war. 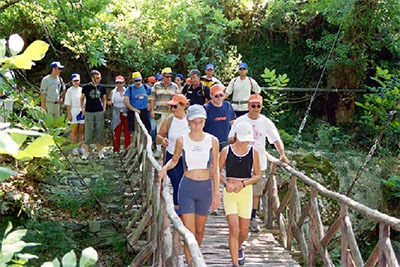 Our sessions you will lead for River Trekking to the beautiful path "Tsuvala" that begins under the village. A natural way at length of stream, with wooden bridges, waterfalls and suitably shaped points of attitude of/rest. In the end of way, after 2.30 hours roughly, we will pass air the stream with flying fox, we will be delivered in the sport of archery, and we will enjoy the barbeque that the persons of Trekking Hellas will have prepared for us.